I like to have a sail with a large windrange. I like a sail which is lightweight. I like something dureable. I like some speed, but more important not just a 3 second acceleration, speed which I can keep up all day (light sail on the hands). I like a cammed sail. I like a sail which is easy to gybe, waterstart, etc. I don't care about acceleration from 0-30 km/h. I don't do slalom and getting into planning isn't a problem. I don't care about max speed at 130~145 degrees downwind course. Most often I sail between 70-110 degrees. I don't care if the sail is used by the (next) PWA slalom champion. It would be prefered if the sails are RDM and SDM compatible. So what is left for those just blasting around? Challenger GT2wing (kind of special?). What didn't make the first cut? These are a bit to much freeride for me, based on online reviews (Ezzy Lion, Tushingham Bolt, Simmer 2XS, Attitude Hornet). Severne Overdrive, again a new design, no fussle on the sail. Looks clean. RDM/SDM compatible. Increased twist and less back-hand pressure. If it is not just marketing, this sail sure sounds like a dream come true! KA Koncept, RDM en SDM compatible. Lightweight character. Finetuned design for a decade. Sailsizes from 4.2-9.5 (very wide range). Looks durable. Challenger GT2Wing, I mean who knows what to expect from this sail?? Is it racy or a fancy freeride sail? Most other sails haven't been included because they don't feature RDM capability. Or many small features and fuzzle on the sail (all these small bits are weight and can be broken). Some seem to have a evolution in "looks" and not soo much "technical" evolution (eventhough these sails do not score #1 positions in tests). Erik. 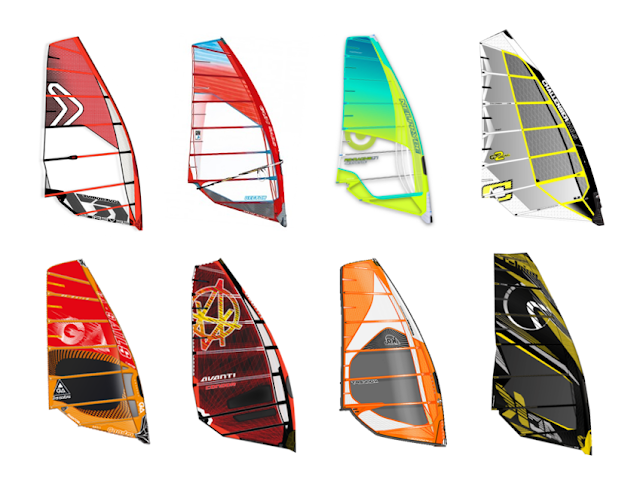 Try the Loft Switchblade, Awesome sail, fast, light and compatible properly with both SDM and RDM. Designed by Monty Spindler!!!! George I actually have a 8.3 2010 loft blade from Monty. Good stuff!! I'm trying to decide between the KA Race 8.7 and the P7 ac-k. I've have Koncept 6.6 7.5 and 8.3 and the 8.3 needs to be changed. Even though the 8.3 have served me well I tend to fall behind on a half wind course and would like a bit more locked in feeling, especially when overpowered. I have both a P7 and KA 490 mast. Do you know the potential in these two sails as well as the durability?